Today was the first day of school for my boys and it was the day of the big eclipse that went all the way across North America (and parts of South and Central America too). We were all very excited — or maybe it was just me — and after a reminder from a friend, I realized that I had to pack an eclipse lunch for Augie’s first day of school. We had a pretty full fridge so it wasn’t very hard for me to come up with an eclipse lunch even though I hadn’t planned in advance. 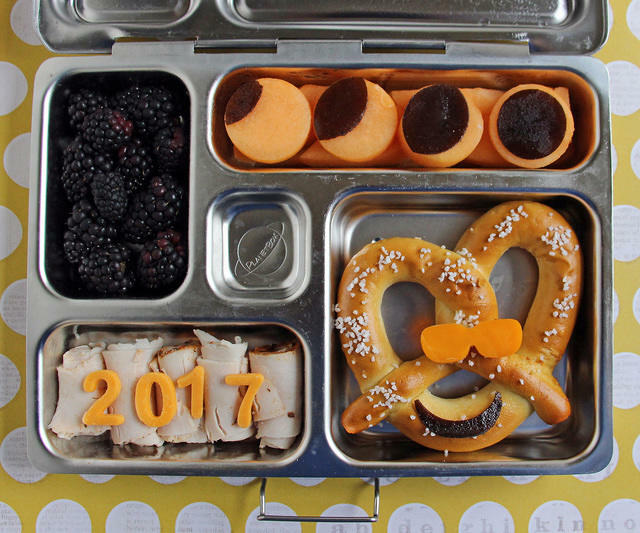 I ended up sending blackberries to represent the darkness of night in the middle of the day, cantaloupe suns being blocked out by fruit leather moons, deli turkey roll ups with a cheese 2017, a couple mini oatmeal cookies and a soft pretzel dude wearing eclipse glasses. Safety first! I packed it all into our PlanetBox Rover (appropriate for the theme!). It was also my eight grader’s first day of school, but as we’ve previously discussed he is no longer into cute lunches, so I kept his a lot more simple. 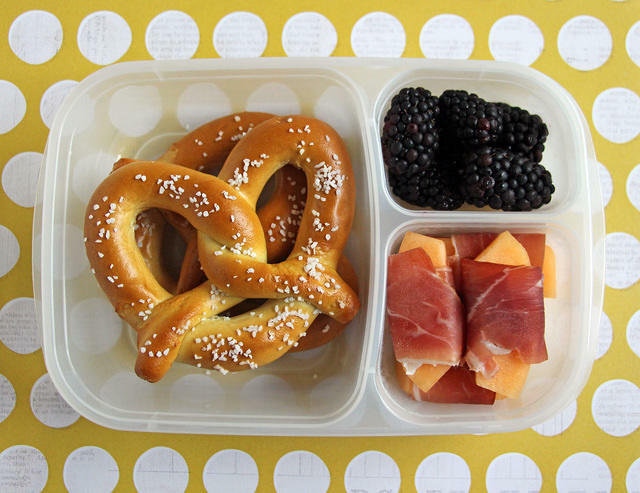 I chose a middle-schooler-approved EasyLunchboxes bento and filled it up with two soft pretzels, blackberries and some cantaloupe chunks with strips of prosciutto wrapped around them. It was 100% grey and overcast! I’m no quitter though, so I made some pinhole viewers out of cereal boxes anyway in hopes that I might be able to see something. But the sky was so overcast that I couldn’t even figure out where the sun was in the sky. All I saw in the bottom of my cereal box view was the bottom of a cereal box. The NASA live stream had some pretty good pictures though! How was your eclipse? Did you see anything?